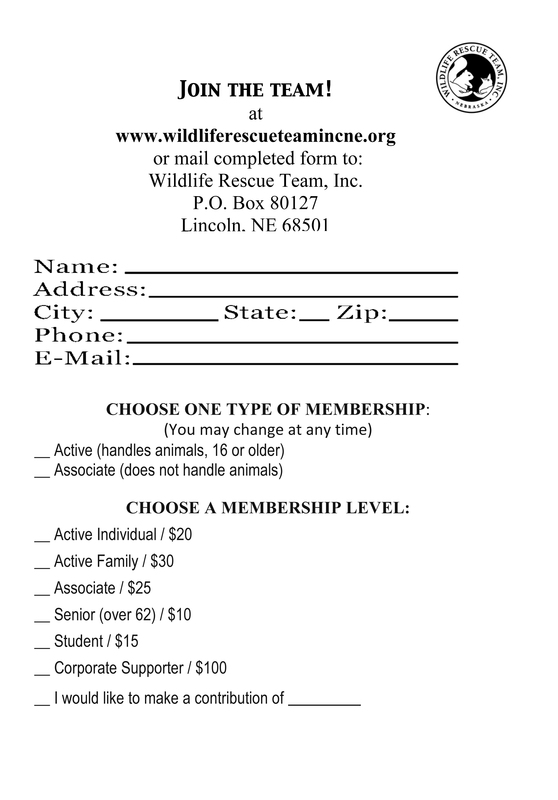 Membership Paperwork - Wildlife Rescue Team, Inc. If you would like to be an Active member (handles animals), please print out and complete the forms to the right. If you are an adult, complete "Join the Team", "WRT Active Membership Agreement", "WRT Membership Information" and the "WRT Release from Liability for Adult". If you are a minor, complete "Join the Team", "WRT Active Membership Agreement", "WRT Membership Information" and the "WRT Release from Liability for Minor". Minors can be members, as long as they are 16 years of age and have parental permission. You MUST read the WRT Bylaws and acknowledge that you have read them by signing the WRT Active Membership Agreement. If you would like to be an Associate member (does NOT handle animals) complete the forms "Join the Team" and "WRT Membership Information". You do NOT need to complete the "WRT Active Membership Agreement" or the "Release from Liability". We would like you to read over the WRT Bylaws, so that you understand the rules and regulations of our group. If you have questions, contact us at (402) 473-1951.